The RSEC Learning Report describes the groundbreakingRural Social Enterprise Constellation (RSEC) project (2012 - 2015) sharing its accomplishments, the voices of rural stakeholders, key learning, and, most significantly, insights for action: ways to continue building the capacity of rural and northern nonprofits to strategically engage in social enterprise and provide leadership in the larger social enterprise (SE) sector. The value of Post-Secondary Research and Engagement that provides academically validated information on the sector, increases capacity for social enterprises, introduces students to SE, and begins the much needed to integration of additional information on rural SE into post secondary courses. The dynamic inputs of various intermediaries that is required to join networks together and build connections across the Rural SE and Ecosystem in a collaborative non-competitive way. The graphic above shows the project’s holistic and complex model for change. 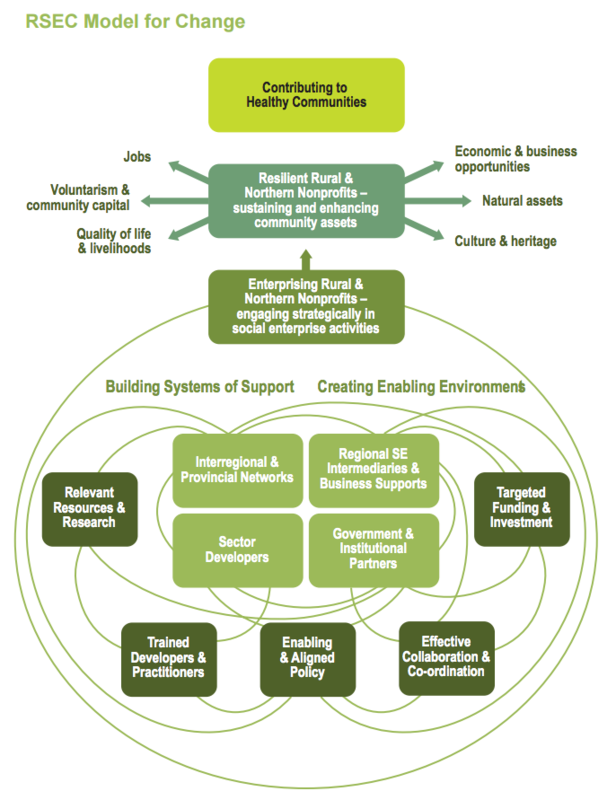 RSEC's approach and insights are also portrayed visually in the compelling Rural Vitality info-graphic at the head of SEontario.org Rural Social Enterprise space.